Prominent & Leading Manufacturer from Chennai, we offer garment software. 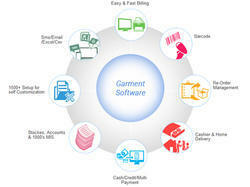 We have developed a very user-friendly & easy accessible Garment Software to our esteemed clients. Unskilled & non-technical persons also can operate, easy & fast. Our Garment Software Specially designed for managing the garments with respect for their different categories such as Brands, Sizes, and Price etc. Even there is a provision of managing the stock of garments season- wise. We have added beneficial features like Barcoding, Inventory Management, Quick Billing, Stock maintains and daily, monthly & annual reports.